Having been given a recommendation to try The Brampton Pie Company in Huntingdon, a trip to see the football and review the pies at Cambridge United proved too good an opportunity to miss for Pierateers RAS and SJL. They would be driving right past Huntingdon on the way from Birmingham. It took us a little while longer to find the shop than we expected but when we did it was worth it. Brampton Pie Company was a fairly unique place. There was no fancy branding or cool interior like many modern speciality pie shops (Piebury Corner, Urban Pie or Square Pie spring to mind). Brampton Pie Company was much more simple - clearly investing their money not in the fancy interior but what really matters: the pies! It reminded us of a butchers shop. In fact they do also sell meat and other other savouries in addition to the pies. 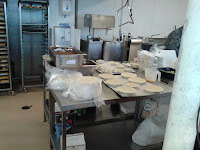 What we loved about The Brampton Pie Company was that you could see the pies being made before your very eyes. 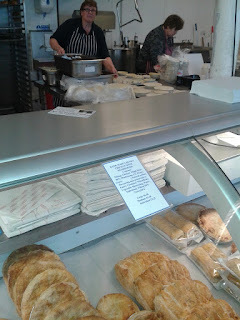 They had a number of staff on the other side of the counter preparing the pies and making the magic happen while we ordered! The counter had a wonderfully large display of pies. Whilst a range of flavours were present but they were all pretty traditional flavours. They were not trying to reinvent the wheel in this shop, but if it isn't broke, why fix it? The top of our pie rankings are filled with traditional flavours. Unique flavours might capture our attention for a while, the classic flavours like steak and ale are the ones we buy regularly. We got up close to a pie being created. 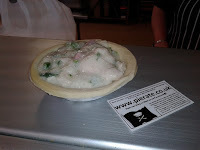 We must warn you though, despite being a great place to visit, there is one thing about The Brampton Pie Company that we found really strange. 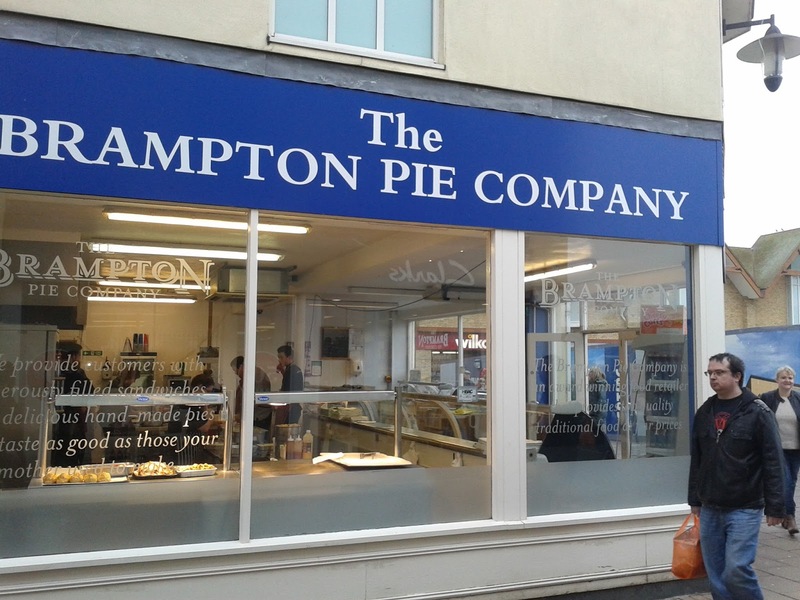 They will sell you a hot pasty or bacon sarnie, but THEY DO NOT SELL HOT PIES! By this we mean they are not ready to eat there and then - you have to take them home to cook them! This is a very important point, especially if it is lunch time, you have travelled all the way from Gloucester/Birmingham and you have been anticipating a delicious hot pie. We were unable to pin down why this was the case and can only assume it is to do with having to pay VAT on hot food, but at that moment we would both have certainly paid extra to have our pie hot! This was an excellent pie, one of the best value pies I have eaten in a long time. Brampton Pie Company's slogan is 'top quality traditional food at fair prices' and I think this pie exemplified the slogan. 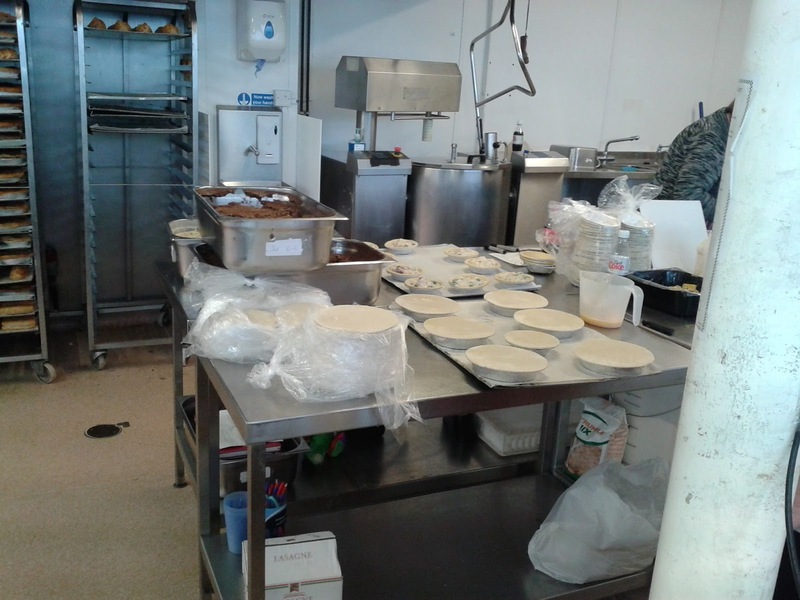 Condition – 5.60 out of 7 - The pie arrived in good condition. It was fairly simple to look at but I still thought that it looked really tasty even before I delved in. It has the slightly uneven appearance of a handmade pie. 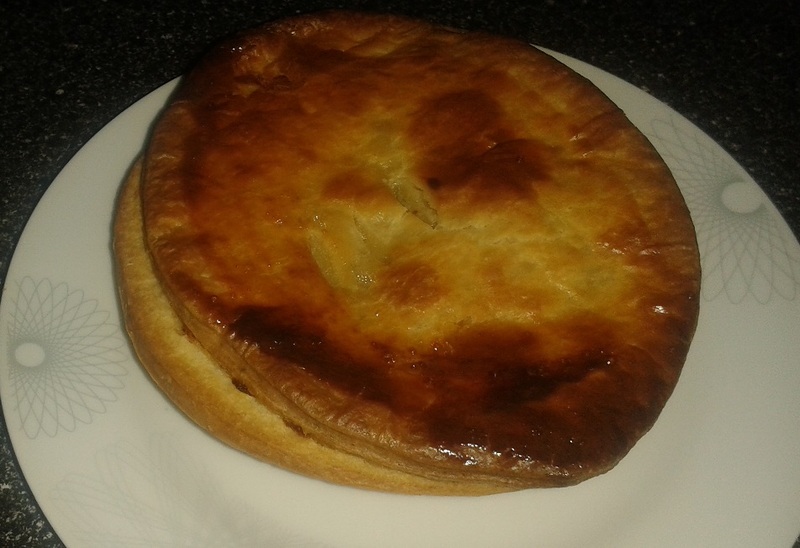 Colour – 6.60 out of 7 – For me, the mottled glossy golden brown on top of this pie is just what I look for in a good pie. The sides had also browned up a bit. 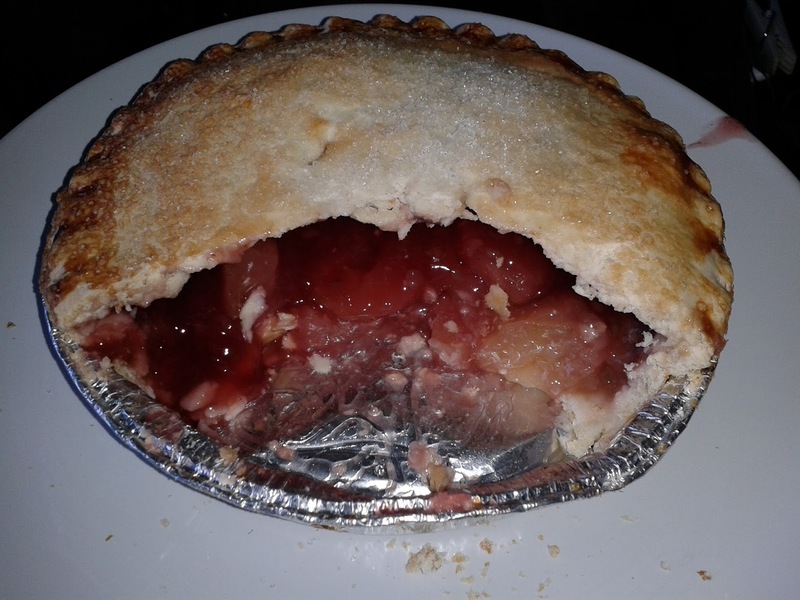 Cheapness – 6.80 out of 7 – This pie was much larger than most individual pies. At £2.25 it was great value. 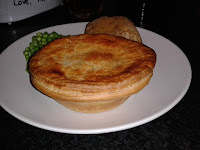 Top quality steak & ale pies normally retail around £3-£4 and are rarely this big. It was also well filled with steak chunks which is rare at this price. I think I may move to Huntingdon to save money on my pie consumption. Capacity – 6.50 out of 7 – As I said, this was a large pie for one person to eat. It was fairly tall so it had a good amount of space for filling. It only had a small air gap. Chewiness – 5.90 out of 7 – The texture of the pastry was perfect, it was crunchy on the outside and soft and gooey in the middle. There were plenty of meaty chunks to get your teeth into. For the most part the filling was tender, it only lost some score as I did find a couple of pieces more chewy than I would have liked, but not significantly so. Content – 6.80 out of 7 – Wow, a really rich meaty sauce filled with meaty chunks. There was also mushroom in the pie which I am not always a fan of but here it worked well and added a bit of variety to the filling. There was a nice flavour to the thick sauce and I was pleased that it wasn't overly salty. 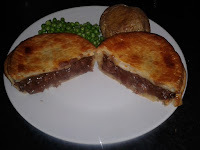 I hasn't got a perfect score because whilst it was tasty, it didn't do anything really special in the flavour department, it almost had a slightly 'generic' steak & ale flavour, a flavour similar to so many pies I have eaten before but never normally done this well. 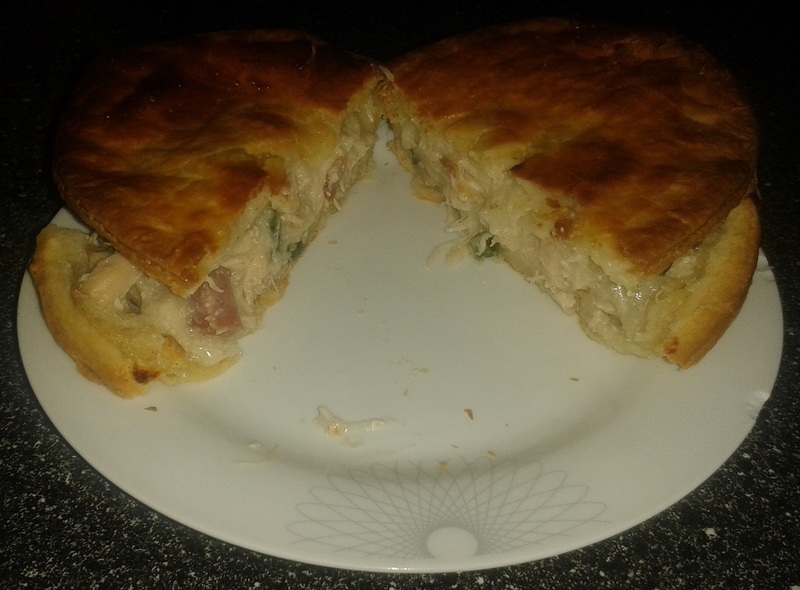 Consistency – 6.80 out of 7 – Filling and pastry came together in beautiful harmony to make this a Pierate Highly Recommended pie. It had many qualities that I would look for in the Ultimate Pie but at a price cheaper than many other pies with similar scores. Condition – 5.60 out of 7 - Again, a good but simple appearance. Colour – 4.80 out of 7 – Glossy, melted sugar at the edge but the middle was a little pale for some reason. Cheapness – 4.90 out of 7 – This pie cost a bit more at £3.50. I ate it all myself but I am guessing it was meant for sharing. It was a bit smaller than your average supermarket family size fruit pie. However, it had a larger capacity than most so was not bad value. Capacity – 4.80 out of 7 – This pie was tall and had a good amount of filling but the air gap was not insignificant. 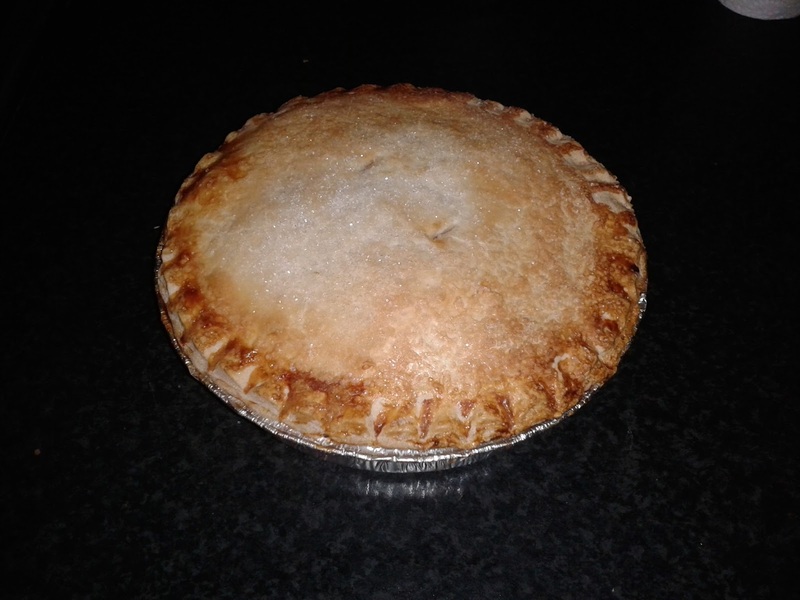 Chewiness – 6.00 out of 7 – There were satisfyingly large chunks of apple to get your teeth into, pretty good texture for a fruit pie. Content – 6.10 out of 7 – A bit on the sour side but it was just the way I like my fruit pies. There weren't a lot of visible bits of raspberry but there was plenty of raspberry taste in the fruity sauce. Consistency – 5.50 out of 7 - Overall, this pie was quite delicious, the sweet pastry was complemented by the thick fruit sauce. It worked both hot and cold. What can I say?! It's very hard to fault such good, affordable pies! Another top quality meat pie from the Brampton Pie Company that once again proves that a quality pie at affordable prices is not just a pie-pe dream but is being delivered! I too couldn't really believe that these pies were just £2.25 for an individual pie when they are packed with up to an incredible 80% meat (40% of the pie's total ingredient). That's right - not the 15-20% meat like many supermarket pies we've had in the past! The Brampton Pie Company clearly put the customer above profits and make a meat pie filled with... well, meat! The pastry was very good, even if the colour of the pie was slightly patchy in places (see photos) and the condition of the pie suffered slightly due to the collapsing of the pastry partly under the weight of all the meat inside! (It should be noted that this pie - because it had to be bought cold, rather than hot, did have to travel to Cambridge and then back to Birmingham before being cooked and eaten, thus the condition bears in mind the slight wear and tear of car travel. I expect the condition would have scored higher had it been provided to me hot in the shop for immediate consumption.) The ham and leek added a bit of a mix to the flavour and the chicken was not chewy. One slight comment to make is that the chicken meat is chicken thigh meat, rather than the chicken breast that most pie companies would use in their pies. While I don't think this actually had any particular negative to the pie flavour - in some cases thigh meat can be more distinct and flavoursome than breast meat anyway! - this would have to be taken into account when understanding the probable impact it would have on lowering price or allowing a higher meat content. Perhaps, however, more companies should follow this lead and use the thigh meat if it brings down the unit price of a chicken pie?! The pastry to filling ratio on these sized pies is quoted as being exactly 50-50 (see the white label in the photo) and to be honest this was absolutely fine and in balance. I wouldn't say the filling was the most exciting chicken filling I have ever eaten (it was a simple chicken, ham and leek pie) but let's face it - you can add all the razzmatazz of freshly picked herbs, spices and fresh vegetables flown in from the other side of the world you want, but what I want is a quality pie at an affordable price, and this pie does just that! Great work! Our dozens of gold awards for excellence, our champions trophies and certificates are all tucked discreetly away . Why? Because we know, and all our staff know, it matters not a jot how many awards we have: we are only as good as our last pie!